Chigusa was not born into refinement and elegance. 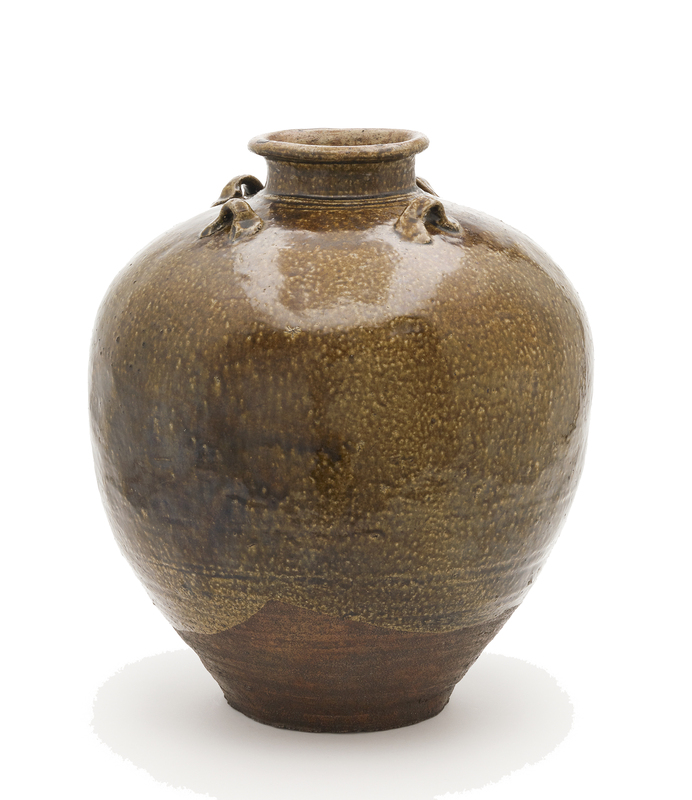 It was a utilitarian piece, a large stoneware jar made in southern China in the 13th or 14th century and exported to Japan for use as a commercial container. Large at 16.5 inches high with four lugs around the neck and a mottled amber iron glaze that swoops down in overlapping ovals, once in Japan it was used to store tea, and it was this association that paved its road to glory. Chigusa worked uncomplainingly for centuries to earn a proper name, exquisite adornments and the contemplative gaze of some of the greatest masters of Japan’s tea culture. It had an important job. Matcha, the powdered green tea used in the tea ceremony, is harvested in May when the leaves are still young. Tea connoisseurs would stamp their names on the base of their jars and send them to the growers in the spring so the freshly picked and steamed leaves could be placed directly in the vessel. The mouth was sealed with a stopper and the tea left alone for six months to allow the flavor to ripen and mature. In November, the jar was opened and the first tea of the year drunk, an important ritual in Japan’s chanoyu (meaning “the way of tea”). The base of Chigusa has four names written in black lacquer. The first of them is Noami, a 15th century artist and tea expert for the Ashikaga shogunate. The next owner to leave his mark was Torii Insetsu (1448-1517), a tea master in the city of Sakai who would be revered by his successors. Ju Soho’s cipher is next. He is known to have hosted a tea in 1573 attended by Chigusa and the tea master Sen no Rikyu, one of the most influential masters, if not the most influential, in the development of tea culture. We know Chigusa was there at this ceremony because another guest, Imai Sokyu, wrote about seeing the “large jar … Chigusa” which had once belonged to the great Insetsu. A few years later the fourth owner, merchant Kondaya Tokurin, added his name to the base. We don’t know who named the jar, but it was likely a poetry reference. The word means “myriad varieties” or “thousand plants” (it alters depending on which characters are used). 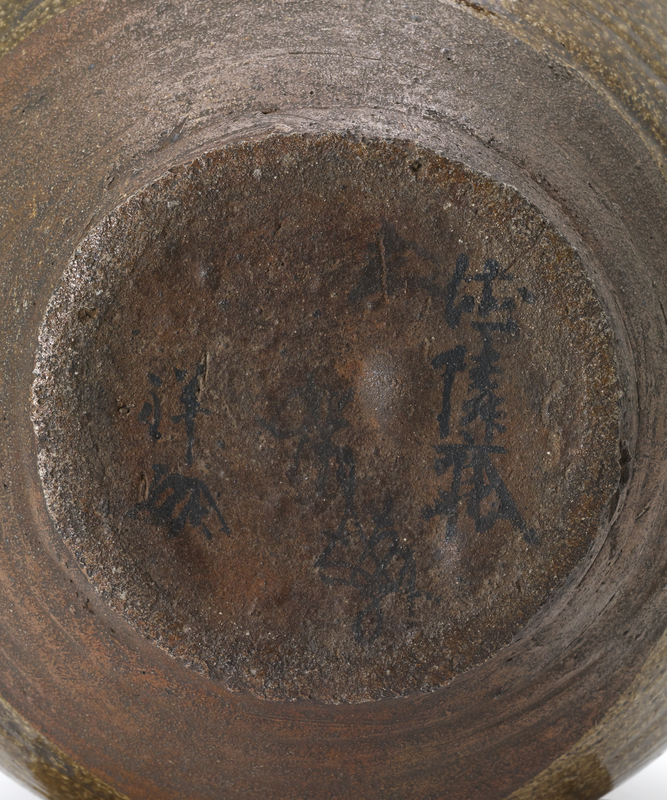 By the time Sokyu wrote about Chigusa, its name was already known and the once workaday storage jar had become a meibutsu, a “celebrated tea object” that inspired masters to look at it carefully, writing journal entries about the smallest details of its glaze, shape and aesthetic significance. 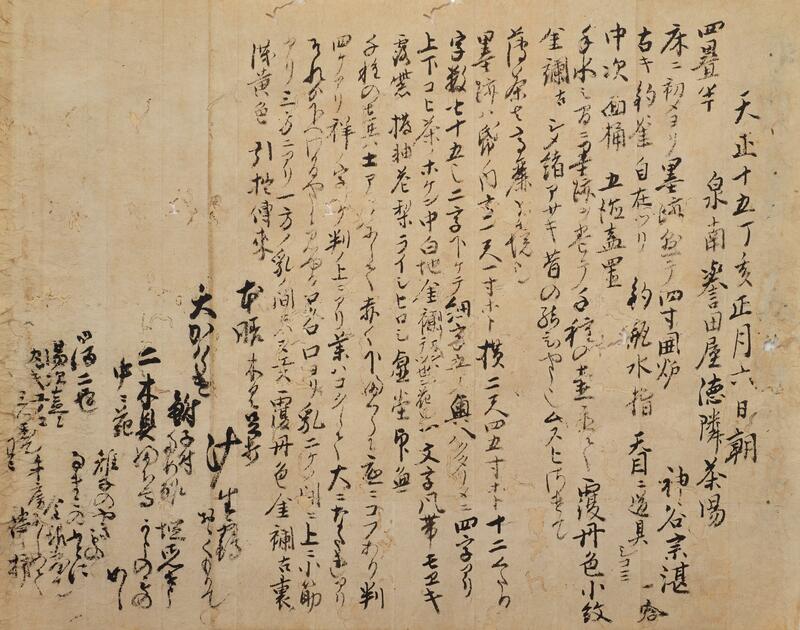 Tea master Yamanoue Soji observed Chigusa at a ceremony hosted by warlord Toyotomi Hideyoshi in Osaka Castle in 1584 and recorded it in his diary. So did Kamiya Sotan three years later. Over the centuries, its rustic beauty would be adorned with precious materials worthy of its importance: a mouth cover made out of gold brocade Ming Dynasty silk, a blue silk net bag from the Muromachi or Momoyama period in the 16th century, blue ornamental cords from the Meiji era (1868–1912). It has three nested storage boxes to keep it and its accoutrements safe. The innermost box was made during the Edo period (1615–1868) from lacquered paulownia wood. What is now the middle box was originally the outer box. It was also made in the Edo period out of cedar wood stained with persimmon tannin. 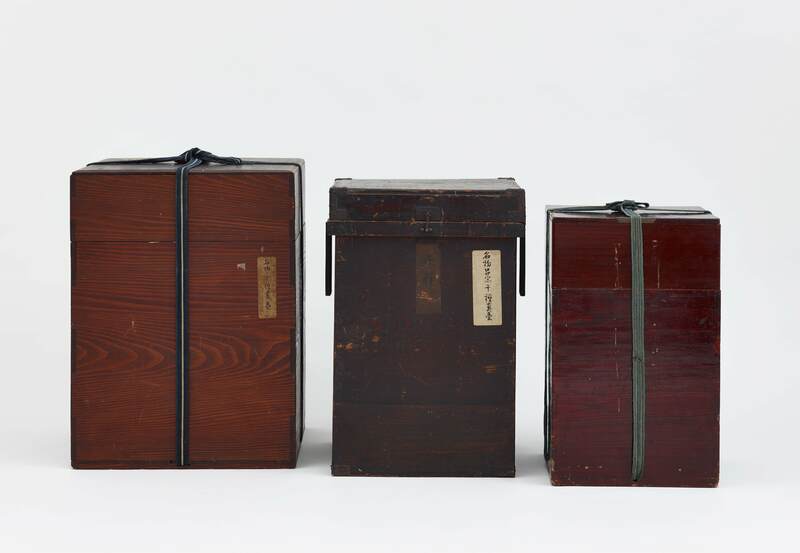 The outermost box today is from the Meiji era. Trays inside the innermost box hold the cords, net, letters and other documentation that illustrates the rich history of this unique jar. By the 17th century, Chigusa was so important it played a part in Japanese politics. During the Tokugawa shogunate, shoguns and daimyos gave it as a gift to seal alliances and prove their loyalty. It remained in Tokugawa hands until the end of the shogunate in 1868, after which Chigusa entered the tea collection market. Wealthy industrialists owned it, allowing it to go on display very occasionally. It only left Japan once in 2009 when it went to New York City to find a new home. 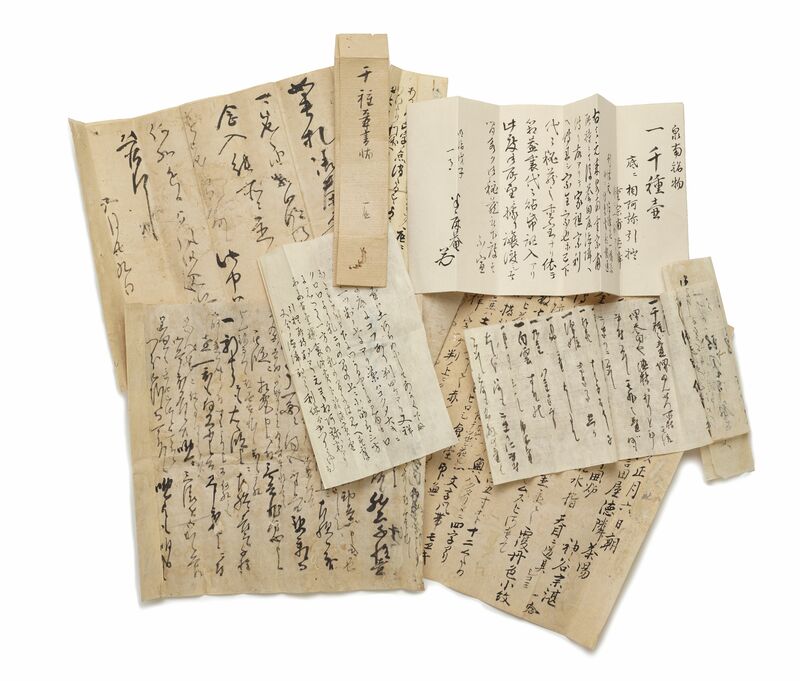 At a Christie’s auction on September 17th, Chigusa with all its goods was bought by the Freer Gallery of Art for $662,500. The Freer and the adjacent Arthur M. Sackler Gallery are the Smithsonian’s Asian art branches, centered on core collections built by their eponymous founders. Chigusa is therefore in good company, despite its great distance from home. 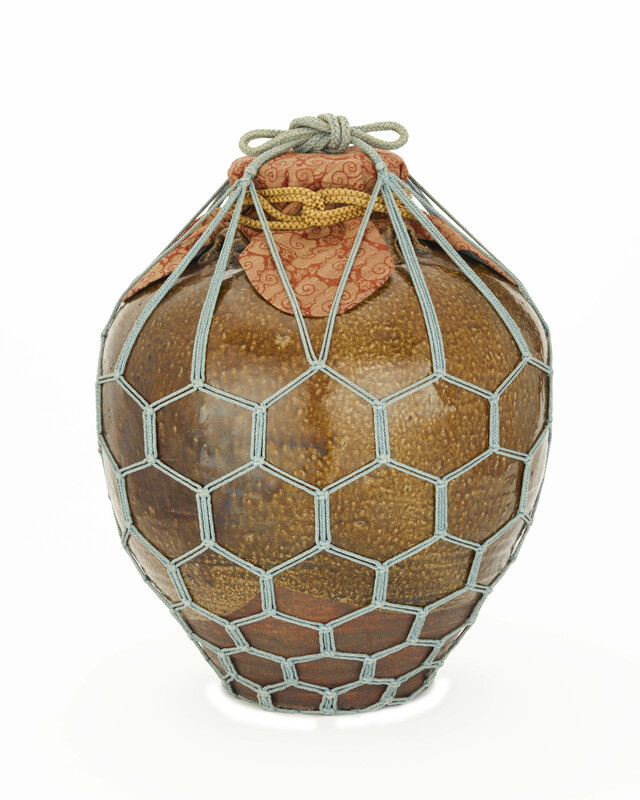 There are only a few hundred such large tea storage jars with all their accessories and documentation remaining in Japan, and only a smattering of remotely comparable pieces abroad. 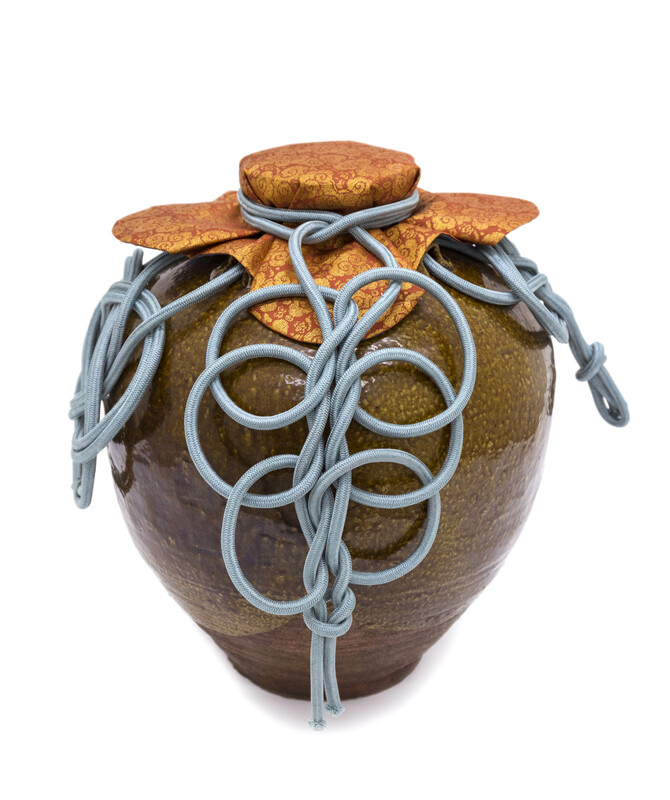 On February 22nd, Chigusa and the Art of Tea debuted at the Sackler. In Chigusa and the Art of Tea, Chigusa holds court alongside other cherished objects, including calligraphy by Chinese monks, Chinese and Korean tea bowls and Japanese stoneware water jars and wooden vessels that were used and enjoyed during this formative time of Japanese tea culture. In order to create the intimate feel of a 16th-century tea gathering, part of the exhibition space recreates a Japanese tea room, complete with tatami mats. 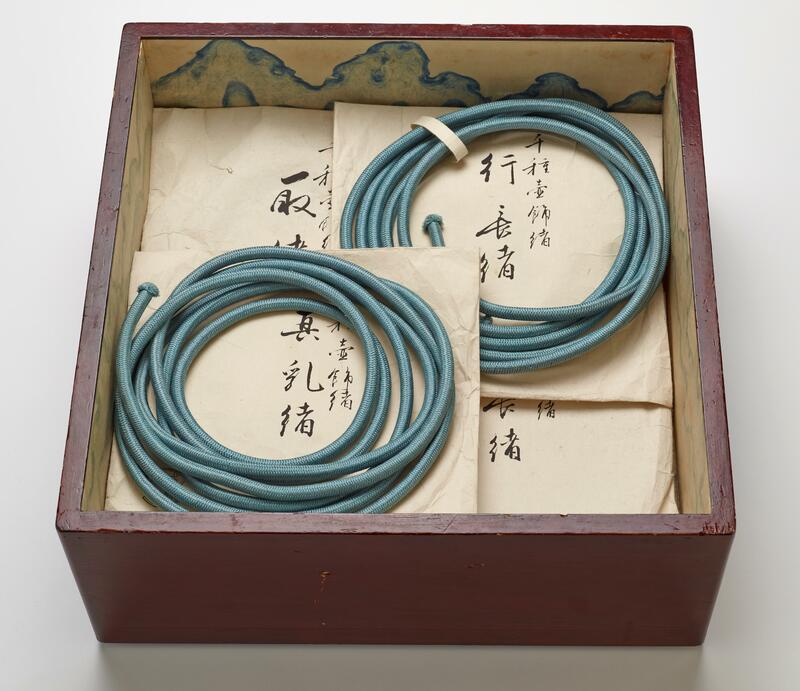 The exhibition includes a video of a tea master ceremonially adorning Chigusa, tying elaborate decorative knots with the blue cords, connecting the blue silk net bag, and tying the brocaded cover on the mouth. A traditional tea ceremony will be hosted for visitors on March 23rd and April 6th. There are also regular lunch tours led by curators and panel discussions with researchers Oka Yoshiko and Andrew M. Watsky. See the full list of events and dates here. The exhibition closes on July 27th, 2014, after which Chigusa will travel to the Princeton University Art Museum in Princeton, New Jersey, where it will be on display from October 11th through February 1st, 2015.